1. Monsters fit into three categories: Normal, event (one hit) and event (3 per kingdom). 2. Each monster has different characteristics. They have their own strengths and weaknesses. Look for the small brown icon at the bottom left of the monster party screen to access details about the monster. For example, you should be used physical attack damage heroes to attack the Magic defense monsters. When you attack a high-level monster, it will first take down the hero with the highest HP, so send all of your strongest heroes to inflict more damage. 3. Hunting monsters require energy to be spent. 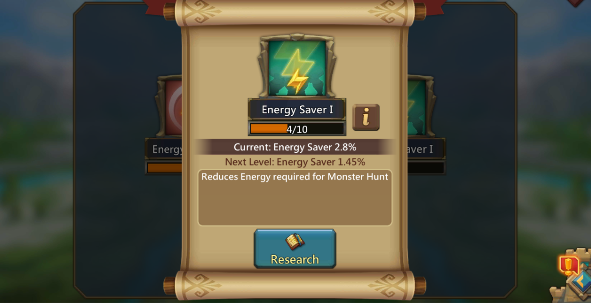 The energy costs of monsters are 3,000 units for level 1, 5,000 units for level 2, 8,000 units for level 3 and 14,000 units for level 4. These energy costs can be reduced via research. When you go to your “Academy”, you will see a tab entirely dedicated to “Monter hunt”. Early on, unlock the first stages and try to max them out. 4. Try your best to level up your heroes and if you have enough money, you can forge a set of monster hunt gear. 5. It is possible to increase your damage by using the DMG Boost x(X) function. Here the (X) stands for the number your damage is multiplied by. 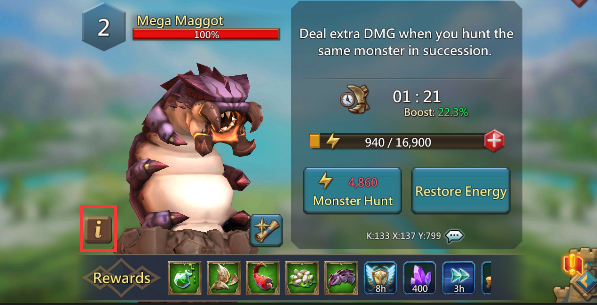 You can multiply your damage if you have enough energy to complete (X) monster hunts. Here is an article about Best Heroes Composition for Hunt Monster, please check it. If you have any other tips for the monster hunt, please leave the comment below.